My name is Neythra and I am 13 years old. I was diagnosed with acute lymphoblastic leukaemia January 2014. I love to tap dance, but in some of my lessons I got an unbearable neck pain and couldn’t continue. It was late at night on 17 December that I got my first idea that something was wrong; I couldn’t feel my legs and I started to cry. My mum and dad rushed to the room and helped me to sit up. After a short while my numbness resolved. But within a short while I had a facial drop on the right side of my face and lost all sensation. My heart was pounding. My mum and dad, who are both physiotherapists, thought I had a stroke and called the ambulance immediately. Before I knew it, the ambulance crew was putting all sorts of funny equipment on me. I heard the machine beeping and I stared at the luminous blue lines that were bobbing up and down on the screen. I didn’t know what they meant but I knew there was something wrong, I could feel it. A woman from the ambulance crew asked me what my best friend’s name was. I knew what it was but I just couldn’t get it out. That was the worst feeling in the world. We were given a room at the hospital and stayed there for around four weeks. The doctors thought it could be encephalitis or meningitis. They soon found out that pressure in my brain was really high. I had my first lumbar puncture to relieve the pressure. Soon after, I had a line inserted in my hand for medication. To take away the pain they gave me laughing gas and I couldn’t stop laughing. We hoped to get home for Christmas but it just didn’t happen; I was vomiting anything I ate up and couldn’t even keep a mouthful of Christmas dinner down. We were transferred to another hospital in the middle of the night and the nurses took us straight to the High Dependency Unit (HDU). I was in HDU for two nights. In the morning a doctor came and said that I might have tuberculosis. I looked up at my parents’ faces – I could see they were scared too. A neurologist came the next day and looked into my eyes with his torch. He said that they were red and bulging and that I had papilledema, a problem caused by increased pressure inside the head. The pressure in my head was high again. Maybe it was due to all the tap dancing I did in HDU! The nurses wheeled me on my bed to the treatment room and I was given a dose of a sickly white medicine. Suddenly everything became a blur. All I could hear was faded voices in the background. I was woken by the gentle comforting of my mum. She gave me a kiss on my forehead and said: “Everything’s going to be alright”. These words will stick with me for the rest of my life. The lumbar puncture test results were back soon but results were not conclusive as the steroids I had been taking masked the results. Both of my parents were given a room at Ronald McDonald House, which houses the families of patients. I had never spent a night away from my parents in hospital before. This would be my first time. I had lots of blood tests but all of them came back clear. There was nothing in my blood. I also had an MRI; the doctors were concerned about a dark shadow so they did another lumbar puncture. I started feeling there were too many lumbar punctures. The next day the results were back. The doctors took my parents into a room; they were there for quite a long time. After a while my parents and the doctors came back downstairs. They all had the same sorrowful look on their faces. My dad whispered in my ear that I had leukaemia – not in my blood or bone marrow but in my brain. They started me on an intense dose of chemotherapy, lumbar punctures every week and loads of medications every day. For over a month I was on steroids, I was blown up like a balloon and weighed a ton. I was also on Vincristine and Daunorubicin which turned my wee red! I could hardly walk and couldn’t get out of bed. I was on a different protocol to everyone else because I had the leukaemia in my brain. On 10 of February 2014, I had another MRI and on 13 February 2014 the results were back. There was no sign of the shadow. 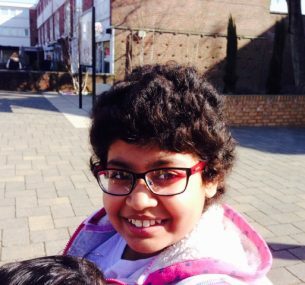 The leukaemia cells in my brain had all vanished! I was overjoyed! We all celebrated by going to a small restaurant. This was a great treat as I would normally not be able to go out of the house because the neutrophils in my blood that fight germs were so low due to chemotherapy treatment. The treatment still has to carry on for two years just to make sure the cancer doesn’t come back ever again. I wrote a letter to Starlight, a children’s charity that makes wishes come true for children going through tough treatments. I asked them if we could go to Hawaii because it has a special place in my heart. My dad described the rolling waves tumbling onto the glistening golden beaches and dolphins leaping out from the clear blue sea when I was in the hospital. He promised that he would take me there when I was all better. It always used to put a smile on my face. Soon after sending the letter, I received a reply from Starlight. They said yes! 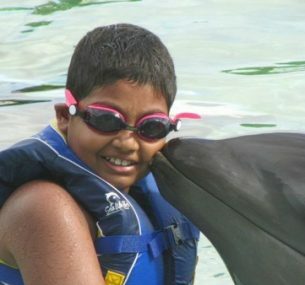 In Hawaii, I wanted to go swimming with dolphins but I had a Hickman Line and that was not allowed to touch water. I chose to have a port-a-cath operation to replace my Hickman Line, which would allow me to go swimming. This painful experience has taught me lots of things. I used to complain of a simple bang on the head but now I know that that’s nothing compared to this. I have learnt how precious life is and not to waste it making the wrong decisions. I am now in remission. It’s fascinating how time flies! I have just over one year of chemotherapy left to complete. We came back from the trip to Hawaii arranged by Starlight in November and we are already thinking of going to the Caribbean to celebrate finishing my chemotherapy. In September 2014 I passed my secondary transfer test and I am enjoying secondary school. I am back to normal now but we still have to be careful about going to crowded places like the swimming pool. I sometimes miss going out to places but we always do fun things at home. Last year my uncle signed-up to raise money for Children with Cancer UK by running the London Marathon. He trained really hard and sometimes I went for a short run with him. Thank you for taking the time to read my story. I hope my story helps someone.